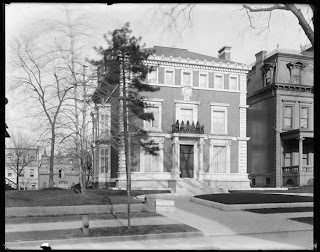 The George Dupont Pratt residence designed by Babb, Cook & Willard c. 1901 at 245 Clinton Avenue in Brooklyn, New York City. Since 1918 the home has been part of St. Joseph's College, click HERE to see the residence on google street view. Click HERE for a Christopher Gray Streetscapes article on the Pratt houses of Brooklyn. Photo from the Museum of the City of New York. For those not familiar with Brooklyn's Clinton Hill neighborhood, while the Pratt Houses are a highlight, the long rows of brownstones, magnificent churches, Pratt Institute and what is probably one of the most diverse grouping of townhouse styles in Brooklyn, together make a walk through Clinton Hill a must do for any lover of historic homes and architecture. Adjacent Fort Greene only adds to the architectural overload. Definitely continue to showcase brooklyn architectural photographs from the often under rated borough of new york. I would also add a walking tour of Park Slope to any visitors itinerary.